ORLANDO, Fla. (IBS Booth #W3440) January 11, 2017 – Creating a dream outdoor living space has never been easier. Trex Company, the world’s largest manufacturer of wood-alternative decking and railing, and leader in high-performance outdoor living products, has introduced a wealth of easy-to-use online tools and resources that are not only inspiring and empowering homeowners but also helping to improve consultations and communications between deck builders and their clients. Inspiration Gallery – The Inspiration Gallery is an online resource to help homeowners visualize their outdoor living space. The gallery features photo collections of the best composite deck designs that span regions, sizes, features and style preferences. Contractors and homeowners can sit down together to peruse the images to find ideas, spark their creativity and get busy planning. Deck Design Plans – The new Deck Design Plans tool offers users three ready-to-build deck plans representing the most popular and versatile designs for today’s homes. Once a user selects a design, the tool provides a print-out that offers details of the deck’s dimensions and Trex materials needed, as well as an overview of the design’s benefits so that contractors can assure their clients that they are selecting the ideal design for their planned outdoor living activities. Decking & Railing Duos – To help simplify railing selection, Trex’s new Decking & Railing Duos guide provides a series of pre-selected railing looks to pair with some of its most popular decking colors. The feature navigates site visitors through the railing selection process, allows users to explore the latest trends and offers customized, designer-curated pairings – helping visitors find a perfectly paired look for any outdoor living space. Deck Cost Calculator – The Trex Deck Cost Calculator is a valuable tool for helping homeowners make informed decisions regarding their deck’s size and features. This easy-to-use tool estimates the material costs for a deck build based on size, substructure and the decking products being considered. Deck Sample Program – Seeing is believing, and with the online sample program on Trex.com, contractors can encourage their clients to see firsthand how different colors and textures work with their home’s architecture and décor, with quick and easy home delivery by USPS. “Trexperts” Videos – Trex has teamed with backyard design experts Paul Lafrance and Kate Campbell of HGTV’s acclaimed “Decked Out” series to help consumers achieve their outdoor retreat. In the “Trexperts” video series, the dynamic duo shares tips, trends and tricks for designing and building functional and fresh outdoor spaces, and help build the case for using Trex. The complete portfolio of Trex outdoor living products will be on display during IBS in Booth #W3440. 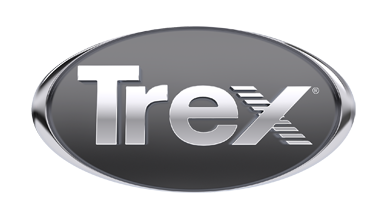 To learn more about Trex, visit www.trex.com.